A feisty damsel at Roatan. MY FAVORITE FISHES TO ENCOUNTER ON THE REEF are three-spot damselfishes (Stegastes planifrons), feisty little guys (usually three to four inches long) that sometimes find you before you find them. That’s because they’re herbivores – algae eaters – who “farm” algae patches for their personal consumption. They constantly weed out the algae they don’t want, to make room for the types they want to encourage. And they guard their little gardens ferociously, nipping at and chasing off intruders much bigger than they are – whether parrotfishes or divers. You do see a lot of them on the reef, patrolling their little areas of coral, but sometimes you pass by a little coralhead and the first indication you have of the damselfish’s presence is being nipped on the hand. Not serious but noticeable. 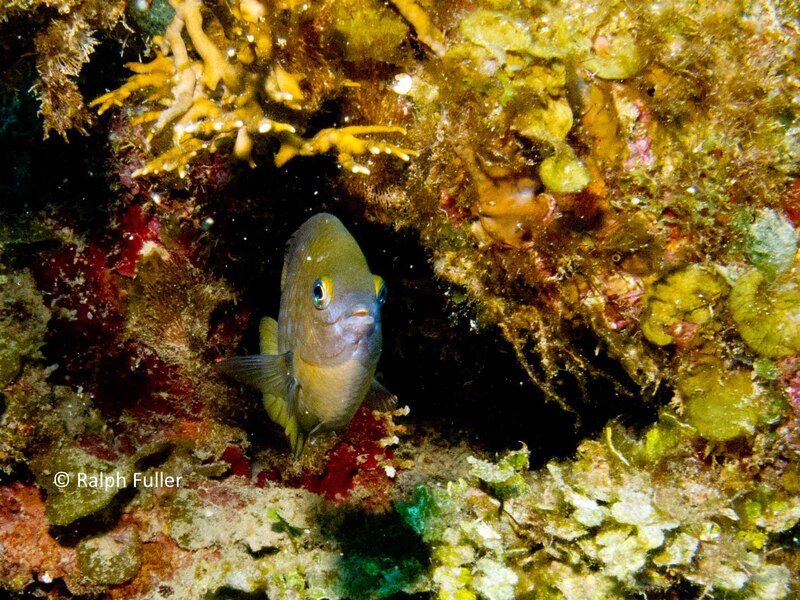 Nipping or not, they dart around frantically and likely give you the Damselfish Stare of Intimidation. Until you go away.